Back in October we reported that Procter and Gamble sold off some parcels in Fort Point to developer, Anchor Line Partners. That 40 acres is located right next door to Coppersmith which also sold back in May….to Anchor Line Partners. So it should be no surprise that a brand new development is being proposed for this area to the Boston Planning and Development Agency by Anchor Line Partners. 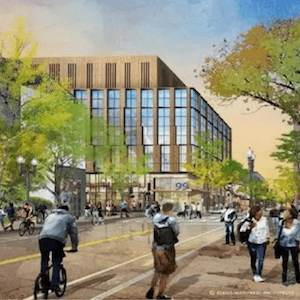 Alexandria Real Estate Equities and Anchor Line Partners have officially proposed a six-story, 210,000-square-foot life-sciences building on A Street with the BPDA on March 22nd. The building will reach 95 feet in height with a 35-foot mechanical penthouse. According to an article by Tim Logan in the Boston Globe, Alexandria’s regional market director stated that some of the reason for picking South Boston was the location is well connected to transit, and “where a younger workforce wants to live.” South Boston is young people central! If approved, Anchor Line and Alexandria hope to start construction ins 2020 and be open by 2022. Logan goes on to report that this lab building might not be the last in the neighborhood. Related Beal is negotiating a deal with Gillette to buy 6.5 acres along Fort Point Channel, which could include some lab space. It is also believed that old GE headquarters site is being marketed as a potential life science project.